Where food has a voice of its own. The following is Pioneer Woman’s recipe with a few tweaks I added for creativity. It takes 10 minutes to prep, 40-45 minutes to cook (depending on oven and browning) and serves 6-8 people. 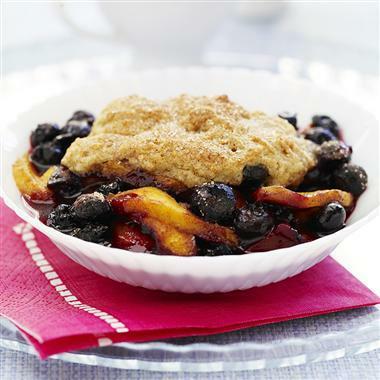 The recipe is straightforward, the dessert is undeniably scrumptious and this is sure to be a crowd pleaser. 2 cans of original crescent rolls. I used one can and it worked just fine. 8 oz/ 1 cup Mountain Dew or sprite. Peel, core and cut apples into 8 slices. This is an opportune time to use that apple peeler and corer if you have one. If not, it’s a great investment. Open box of crescent rolls, and separate them into triangles. Place dumplings into a 9 x 13 inch pan. I used a round clear pan, lightly greased with butter. Roll each apple slice in a crescent roll, starting from the top of the triangle, rolling downward to the tip of the crescent roll. Secure by applying gentle pressure to create an adhesion. Melt two sticks of butter over medium-low heat. Add vanilla, sugar, and gently stir. Mixture doesn’t have to be smooth. Pour butter and sugar mixture over the apple crescent rolls, thoroughly covering apples. Pour Mountain Dew on the sides of the pan, around the appley crescents. Place into oven and bake for 40-43 minutes, until apples are soft, butter bubbles and the crescents are golden brown and crispy. Serve while warm. Toppings may include: ice cream, whipped cream, or whatever works for you! Why not try both versions/substitutions and incorporate the optional ingredients for variety? I’d love to hear your experiences in your comments. Vanilla Bean Coolatta? I think yes! 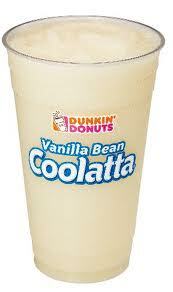 I went to Dunkin Donuts today to get my usual croissant, egg and cheese, when I ordered a Vanilla Bean Coolatta. At first, I was apprehensive, bc I don’t drink these type of slushy drinks unless they are fruity, and figured if this had too much milk in it, it may alter the texture a bit too much. Drawbacks?- the calorie and sugar content, which should not be surprising because *drum roll please* this is a *sweet item* Therefore, if you are watching your weight, or have a special diet, or have diabetes,please don’t drink this. I paid about $2.99 for it, and felt it’s a great indulgent treat from time to time. I even heard that mixing this flavor with the strawberry flavor is blissful. I wanted to keep it simple, so I didn’t, but if you try it, please, let me know what it was like for you. The copycat recipe will be posed on another blog post. Stay tuned! Please rate, comment and/or subscribe. New “Warm Cinnamon Sugar Cookie ” and “Brown Sugar Maple Latte” Creamer Review . Two Newest Additions to the Coffee Mate Posse of Flavors. Quick post. 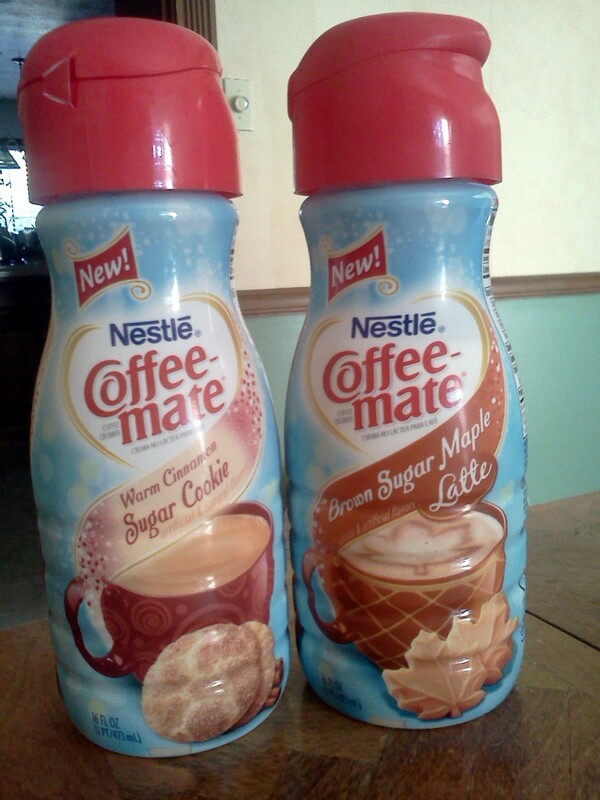 So coffee Mate has released a few new seasonal creamer flavors. One being “Warm Cinnamon Sugar Cookie ” and “Brown Sugar Maple Latte”, and as of now, as I’m sipping on a cup of coffee chock full of “Warm Cinnamon Sugar Cookie ” goodness, I’m disappointed. Why? The cinnamon flavor overrides what I expected to be a smooth, velvety, creamy and rich flavor of a sugar cookie replica. Granted, cinnamon is a strong flavor, but I barely detect sugar cookie/vanilla/creamy traces, and it makes me sad. 😦 It just tastes like cinnamon and sugar. Maybe a caramel undertone to enhance sugar cookie’s natural buttery notes would have been more decadent. “Warm Cinnamon Sugar Cookie ” Yumfactor- 2 tongues and a tastebud (2.5 out of 5 stars) Too much warmth (cinnamon) and not enough sugar cookie splendor. As the “Brown Sugar Maple Latte” is concerned, it’s sweet, not overly sweet, but doesn’t have any depth. I think this could have used a pinch of nutmeg to bring out a spicy flavor, while the other flavor could have gone without the spice addition. “Brown Sugar Maple Latte” Yumfactor- 3 tongues (3 out of 5 stars)This is an average tasting creamer, and really doesn’t stand out much, because the flavors are somewhat muted. Is it good? Sure, it’s not bad, but it’s rather bland in my opinion. Do you agree? Do you think the Sugar cookie flavor is fine as is? Do you think my tastebuds have problems doing their job? Please Rate, Comment and Subscribe! I have not sen a new flavor from Snapple in a while, and while I was grocery shopping, spotted this Peach Mangosten flavor., While I didn’t see the “new” tagged anywhere on this beverage, I decided to give it a try. I love peach, and have had mangosteen and peach flavored teas (a green tea base) so somewhat knew what to expect. 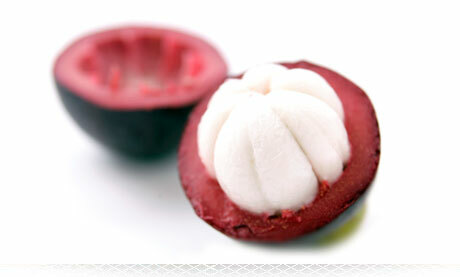 For those who do not know what mangosteen is, it is NOT to be confused with mangoes. Firstly, the flavor is more subtle, and has a tanginess with a slight sweetness in flavor. I have never has it on its own, but I can detect it in the drink. I also have never seen it paired up with another tangy type of flavor, therefore leaving me to believe it’s pretty tangy on its own. Now, on to the drink. I taste top notes of peach and possibly carrot (which makes sense, because there is carrot juice in this drink as well as peach juice), and the peach flavor tastes like a peach Jolly Rancher- complete with a ripe, candy taste, that isn’t overpowering. Then comes the depth from the mangosteen, which surfaces as a tangy bite that ones in after you swallow. Very exotic, as I am reminded of peach and grapefruit (with less tangy and more sweetness), that makes one’s mouth-water. Both flavors feed off each other pretty well, and create a delicate drink. This stands out on it’s own by infusing a familiar sweet, ripe peach with the bold, and tangy mangosteen that boosts the body’s immunity,and promotes anti-inflammation. 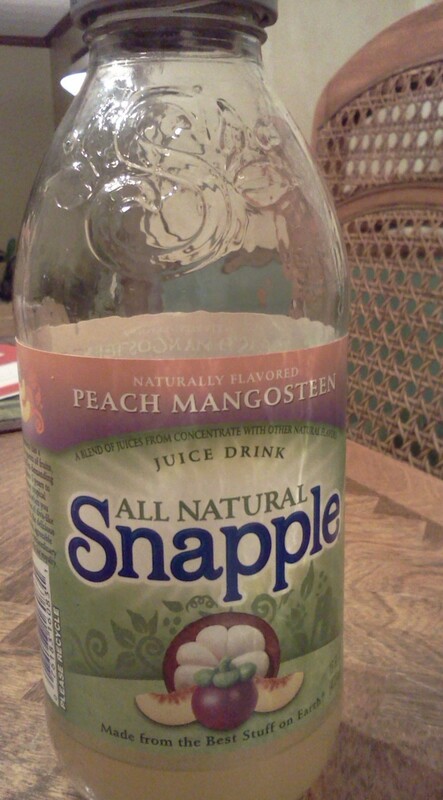 Peach Mangosteen Snapple Yumfactor- 4 out of 5. It’s sweet at first, then takes a tangy twist after swallowing. It will make you pucker a bit, but I like complicated flavors. Unique. Exotic. Watch out for the sugar, as 8 oz has 20g. If you’re expecting the traditional sweet, syrupy drink, this may not be for you. If you’re expecting an extra sweet Snapple type of drink to compare to flavors like Strawberry Kiwi or Mango, you may not like the tartness of this flavor. Publix has launched a few new and exiting flavors of low fat yogurt. It seems that it may be a limited edition release, however, one cannot be sure if these exotic new flavors of yogurt are here to stay. At roughly $0.40 to $0.50 per 6oz container, you can pick and choose from a wide range of Hispanic influenced flavors like Coco Rico (Rich Coconut), Mango, Passion Fruit, Churro, Spicy Pineapple, Prickly Pear,Limonida Fresca (lemon and lime-which I have not tried) and Guava Pastry (Guava Pastelitos). I got excited, because as a child of Miami, Florida, I remember growing up eating hot, fresh, chewy churros from vendors who sold them in brown paper bags on the sides of the busy streets. I also remember going to Cuban bakeries in my town, and getting fresh, flaky pastelitos (little pastries) in a variety of flavors. I knew I had to try this. The containers have a festive and fun band of orange around the top of the container that makes one think about summertime in Miami. The fact that it was low fat didn’t stop me at all. The First one I tried was Coco Rico, or Rich Coconut in English. I was expecting a standard yogurt experience coconut flavoring, coconut flakes, and that tangy undertone of active bacteria (probably not, but I always think that,lol!) that’s so typical. Well, firstly, the texture itself seemed is thicker and creamier. There were no coconut flakes, but a strong,smooth coconut taste that tasted rich, and satisfying. This was not like any yogurt I’ve had before. And I loved it! Coco Rico Yumfactor- 5 tongues (5 out of 5 stars). The flavor was fun, full and fierce! No coconut flakes, not that it’s a problem, but the lack there of adds to the richness of the yogurt. Sweet enough for me, and low in fat! Next, I tried Churro. I was not sure if there were going to be pieces of churros, or just a plain old cinnamon and sugar thing going on. Again, the texture was rich and delicate, and did nothing to remind me it was low in fat. The exotic, and warm spices of cinnamon, and the sweetness of the sugar dances blissfully as I found myself satisfied with this one. Churro Yumactor- 3 tongues and a tastebud (3.5 stars out of 5). 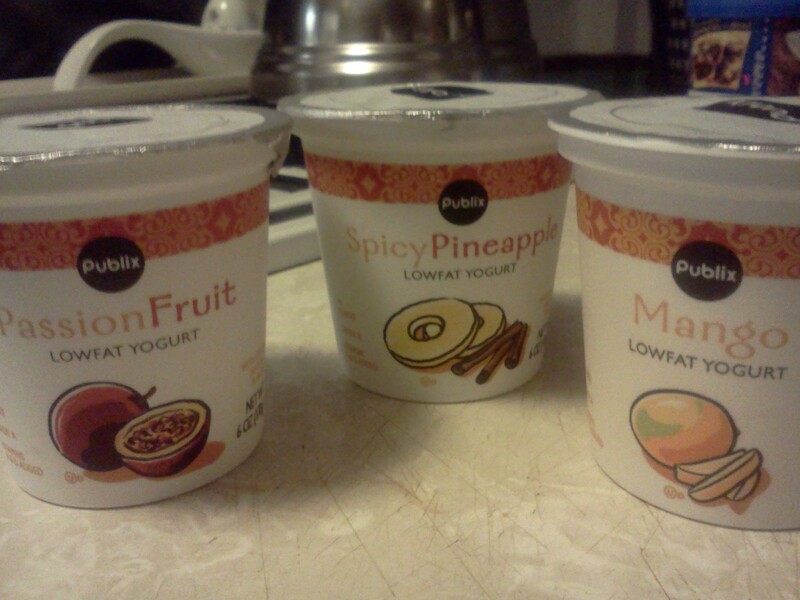 Although it’s great, I usually tend to prefer yogurt with a light and fruity flavor. I like it, but probably would not get it again, as it’s warm and doesn’t contain any fun fruit. Better than I expected, though. I am currently eating the mango, and I have had Publix’s mango “Fruit on the bottom” before, so I had an expectation. This mango flavor was explosive, bold and more strong than the fruit on the bottom variety. There are chunks of mangoes and the color is vibrant. I love mango! Mango Yogurt Yumfactor- 5 tongues! (5 out of 5 stars) I love anything mango, and though some of these flavors may be too sweet for a diabetic, or not sweet enough, I must say this one and the coconut are my favorite. ***UPDATE!! I have also tried “Guava Pastry” and “Passion Fruit” since my last post. Guava Pastry seemed pretty straight forward, based on my experience with trying pastelitos in Miami. Although i didn’t expect to get much of the flaky crust from the yogurt, the guava flavoring was sure to be strong. I ended up tasting a cinnamon and guava interpretation of the pastry, and was somewhat disappointed. I don’t recall tasting much or any cinnamon for that matter in the pastelitos I frequently ate. There were small pieces of guava fruit, which tasted good, but not in combination with the cinnamon. Guava Pastry Yumfactor: 2 tongues and a tastebud (2.5 out of 5 stars) It was all because of the strong cinnamon flavor, which I felt overpowered the sweet guava. This was more warm, and spicy. Not my favorite. And then there is passion fruit. I knew this would be good as it’s pretty straight forward. Not much to say here, outside of the flavors being bold, combining the tangy and sweet exotic richness of passion fruit with the velvety smooth texture of the low fat yogurt. Passion Fruit Yumfactor- 4 tongues (4 out of 5 stars) Summery, fun, and a great intrepretation of the bold fruit. Prickly Pear, I figured would be a tangier pear laced flavor, and it ended up being a bit more mi in flavor. Sweet, and juicy, this yogurt tasted more bland in terms of its exotic name. I give it 3 tongues (3 out of 5) it was just blah compared to the others, but was not a bad pear yogurt. All of these yogurts range in the 30’s as far as sugar content is concerned, just so you know. NOTE:I will include an *update* when I eat the other flavors, just to review all of the ones I purchased. Not only does Publix have an assortment of fun and cool yogurt flavors for less than $1, but yogurt itself packs a punch to infection, and strengths the body. Eating yogurt fills the body with probiotics (or good bacteria) like Bifidum,Lactobacillus bulgaricus, Lactobacillus Casei, Lactobacillus acidophilus and Streptococcus thermophilus ) ” Which basically reduce gastrointestinal inflammation, fight infection in the body, fight yeasts, and food infection and reduces food allergies in people who have internal discomfort in their bowels. Click here for more info Streptococcus thermophilus which will take you to the page I obtained this info from (here, you can click on the link “http://en.wikipedia.org/wiki/Probiotic” including a break down of all the bacteria I listed). I got it from wikipedia, but there are cited sources, along with a list of how the probiotic effect your body. Yogurt can also prevent indigestion associated with lactose intolerance. The Talking Spoon Challenges YOU! Why not practice taking probiotic tablets daily, or making yogurt apart of your daily food regimen? all you need is 1 6 oz serving, and your white blood count will be increased, which helps to fight off infection, your inflammation, decreased, you get both calcium and a serving of fruit, and get yourself closer to living a healthier life! Also, this yogurt is only $0.50 at the most saving you money. Wendy’s is overdosing on wildberries apparently. 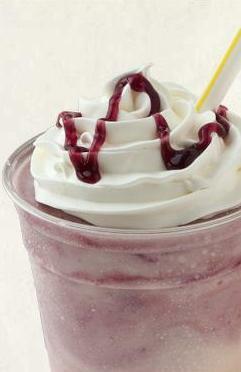 Berry Almond Salad, Wildberry Iced Tea and now, Wild berry shakes. Thankfully, the salad and the shake is amazing. Now, let’s continue. No fair! Mine didn't have the cool burgundy colored syrup on the whipped cream! The consistency of the shake is a creamy, well balanced fusion of ripe strawberries, raspberries and tart blackberries that don’t overpower the overall quality of the treat. It’s thickness is your standard milkshake consistency, but for some reason, reminded my of liquid frozen yogurt. Not a bad thing. Although mine didn’t have the cool syrup on the whipped cream, I’d say this frozen treat is worth a try, not too artificial tasting, though I’m sure artificial ingredients are present, but good enough to be gone in 3 minutes. Not literally, unless you want to experience brain freeze. I believe I paid about $2.29ish for the small size. Wendy’s Wildberry Milkshake Yumfactor- 5 tongues. This is really good, and I have no complaints. Give it a try! Don’t forget to: Rate, Comment And/Or Subscribe! For starters, the cookie is a whopping $.50, the perfect amount of money to try it, and if it doesn’t taste good, you didn’t go broke in being adventurous. (I find that to be a plus. Anyone else with me, here?) Biting into it, one will notice the chewy texture, and the golden buttery taste of the cookie, and then boom… tart raspberry flavor bite and smooth white chocolate, ( or cheesecake for the politically correct). These two flavors meld wonderfully to create a fancy, and pleasant mouthful of nom. Pros– Different= exciting, $.50, raspberry in a cookie!!! 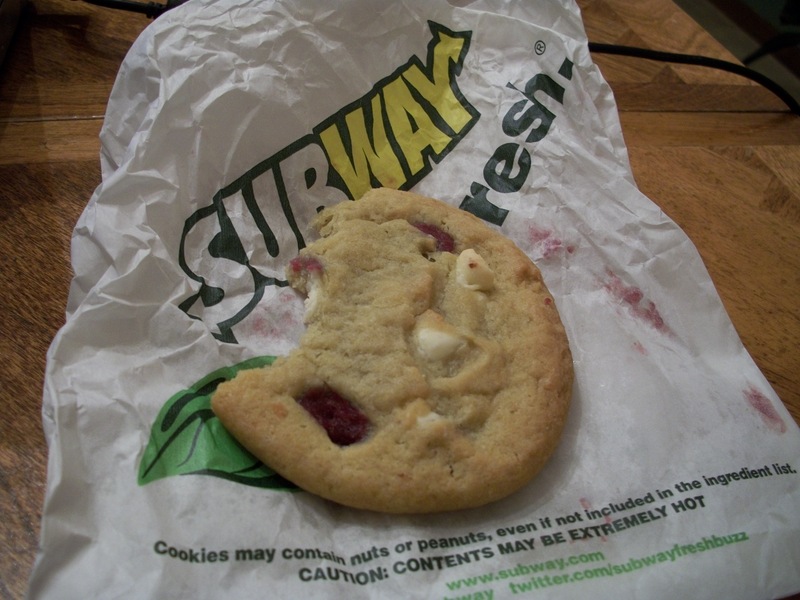 Raspberry Cheesecake Cookie Yumfactor– 4.5 out of 5. Flavor Pairing Ideas: Butterscotch and what? Wendy's Has Sweet Potato Fries!!! Blogs that help my blog.